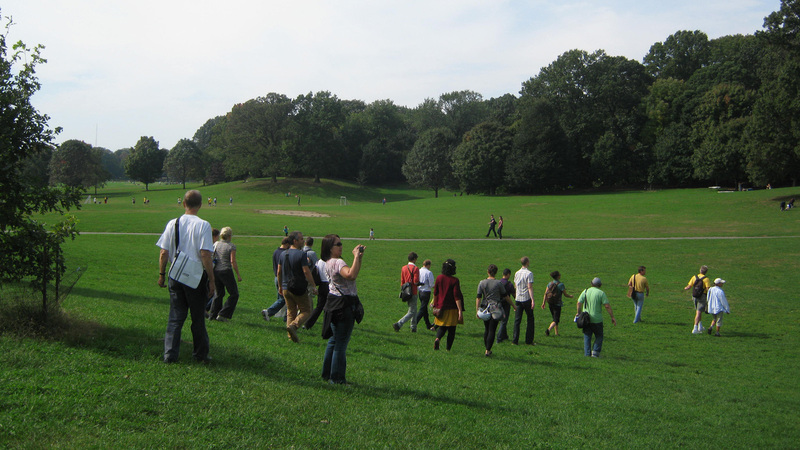 More than 1,000 people explored a wide-ranging group of New York’s significant designed landscapes during TCLF’s What’s Out There Weekend NYC on October 6 and 7. The tours were part of a trio of events held during the weekend, which highlighted the city’s remarkable diversity of historic landscapes, dug deep into the particular challenges of woodland management, and honored the patrons who help sustain these important places. by Sara Cedar Miller, courtesy of theCentral Park Conservancy. The centerpiece was the Friday, October 5, daylong conference Bridging the Nature-Culture Divide II: Stewardship of Central Park’s Woodlands, which was kicked off on Thursday evening with a launch reception at El Museo del Barrio, hosted by the Central Park Conservancy and honoring Central Park steward Judith M. Carson. TCLF presented Carson with the 2012 Stewardship Excellence Award for her important role in launching a comprehensive restoration of the North Woods of Central Park, a key component of the Conservancy’s Woodlands Initiative. TCLF also made the official announcement of the twelve at-risk landscapes included in Landslide 2012: Landscape and Patronage. The reception attracted an energetic crowd including presenters from the conference (held the following day), friends and supports of Central Park, and many of TCLF’s board members, local partners and sponsors for What’s Out There Weekend. The conference on Friday, held at the Museum of the City of New York, addressed the ecological and cultural pressures on the Central Park Woodlands, a subject of discussion, debate and even controversy for more than three decades. It began with introductory presentations by Chris Nolan (Central Park Conservancy’s Vice President of Planning, Design and Construction) and Charles Birnbaum (TCLF’s President and Founder), and was followed by two panel presentations with experts from the New York Botanical Garden, Brooklyn’s Prospect Park and San Francisco’s Presidio, as well as private practitioners with urban woodland management experience. Modernism tour, photo by Eduard Krakhmalnikov.Saturday and Sunday’s What’s Out There Weekend NYC was more broadly focused and featured 27 different free, expert-led tours offered in all five boroughs. As with previous Weekends in Washington, D.C., Chicago, and San Francisco, visitors experienced and gained new insights into parks, gardens, public plazas, and neighborhoods spanning more than 200 years of design. Those who partook of the tour at the New York City Landmarked Wave Hill estate in the Bronx were blown away by the carefully managed gardens and wonderful views of the Hudson River. Led by Laurel Rimmer, Assistant Director of Public Programs at Wave Hill, the tour offered colorful stories about the garden's change and evolution under different owners. Others took in the wealth of community gardens in the East Village on a tour led by various members of the Green Guerillas and organized by Steve Frillman, Executive Director of the group. The tour started at the Liz Christy Community Garden, which Christy and the Green Guerillas established in 1973 as a way to reclaim vacant land in the city. Sunday’s cooler weather and drizzly rain didn’t dampen the enthusiasm of tour attendees. One of the highlights of the weekend was the Midtown Modernism tour led by landscape architects Ken Smith and Donald Richardson. The tour covered four Modernist landscapes in Manhattan, including the Museum of Modern Art Sculpture Garden, Paley Park, Greenacre Park, and the atrium of 590 Madison Avenue (the former IBM Headquarters building). Smith and Richardson fielded questions and described the design thinking behind these iconic and well-loved public spaces, shedding new light in an open discussion on how an outdoor room relates to the street, what it shares with more traditional domestic environments, and why these spaces work so well. (lower) Maureen Hackett at the Bryant Park tour, photo by Courtney Spearman.Visitors also enthused about the tour of Forest Hills Gardens, the picturesque neighborhood in Queens designed by Frederick Law Olmsted, Jr. and Grosvenor Atterbury. Led by local historian and realtor Susanna Hof, the tour started at Station Square, the historic heart of the neighborhood, and then ranged through the curvilinear streets and Tudor and Georgian Revival style houses that make the community so distinct. And the weekend would not have been complete without several tours of Central Park. On Saturday, visitors learned about the Lake & Ramble from Marie Warsh, who shared her deep knowledge about this part of Central Park and Bethesda Terrace, pointing out some of the detailed carvings which tell the earlier story of the park’s use and design. Kate Papacosma’s tour of the Children’s District explained the evolution of children’s programming in the park and how it mirrors attitudes about the role of children in society in general. Sunday’s Conservatory Garden tour was led by landscape designer Lynden Miller, who was responsible for the first major restoration of the park’s only formal garden. And wrapping up the weekend, Lane Addonizio, Central Park Conservancy’s Associate Vice President for Planning, led a marvelous tour of the North Woods & Harlem Meer. Each of these expert-led tours gave the attendees a new understanding and respect for how the park was conceived, how it has changed, and how it is managed today. See more about the other tours offered during What’s Out There Weekend NYC and dowload the map and site booklet. We have already begun planning for events next year – mark your calendars for Philadelphia’s Civic Horticulture Conference and What’s Out There Weekend on May 17-19, 2013!